Mystery Box Giveaway-Valued at $250! A couple of years ago when I started blogging I made some really great blog friends, one of them is celebrating a HUGE milestone of 250,000 Facebook fans and I want to celebrate with her! She has put together this incredible mystery prize. 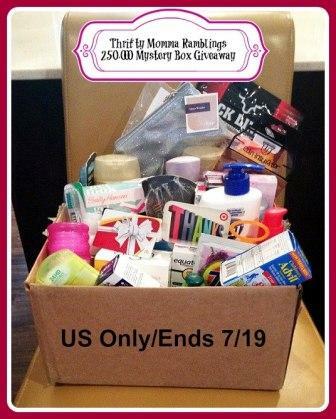 These boxes are loaded with mystery goodies and is worth $250! WOW! This isn’t your average mystery box–this is extreme! There are so many great goodies as you can see a sneak peek in the picture. As you know I ALWAYS add more that you can’t see after the giveaway is over. It makes it much more fun and you never know what will be inside! One lucky winner will receive this AMAZING Mystery Box of Goodies! The giveaway ends on Saturday July 19, 2014 at 11:59PM EST! Just enter on the Rafflecopter form below. Good Luck! One of my favorite stores to shop is Target. Thrift stores and antique shops all the way! Favorite place to shop? Choosing only one is hard! Love shopping but would have to say amazon.com at number 1.. can find anything! Hope that counts as a store! Walmart is my favorite store to shop. I’m always finding great deals at Family Dollar! Hope to win this for my Mom’s birthday. on line Amazon in Person Walmart. My favorite store to shop at would be Target. I love Target! Always so many bargains to find! I love Target! Always so many bargains to find. I love cruising the end caps and clothes racks. I love Target! Always so many bargains to find. I love cruising the end caps and clothes racks. Would love to win your mystery box! Bath and Body works is one of my absolute favorite stores! My favorite store to shop at is Target! target is one of my favorite stores. My fave “store” is amazon! Can find nearly everything there! I love Target and TJ Maxx!! I like to shop at Walgreens for some stuff! I love to shop at Wal-Mart!